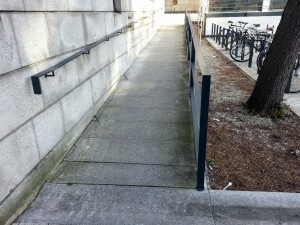 Dublin is NOT accessible for its many vulnerable residents and foreign visitors ! To Register / To Attend … please go to the Event WebSite: www.fire-safety-for-all.eu … places are limited in the New Conference Venue. 1. 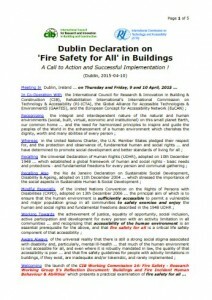 2015 Dublin ‘Fire Safety for All’ Declaration – A Call to Action & Successful Implementation ! From the beginning, we promised that this would not be a polite gathering in Dublin. It will, instead, be a time for hard work and straight talking by everybody attending … and a good opportunity to have some fun also. 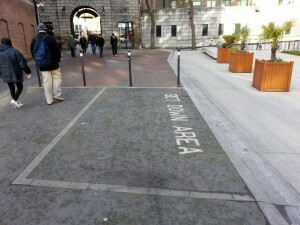 Dublin is a very ‘sociable’ city ! Drafting of the CIB W14 Research Working Group V Reflection Document has already commenced. Please help us to spread the word ! 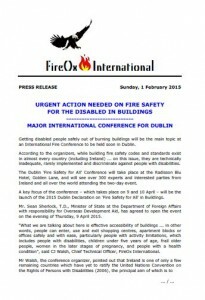 Accessibility of a Building … encompasses the complete cycle of independent use, in a dignified manner and on an equal basis with others … and includes the approach, entry and use of a building and its facilities, egress during normal conditions and removal from its vicinity … and, most importantly, safe evacuation during a fire incident to a place of safety which is remote from the building and reached by way of an accessible route. 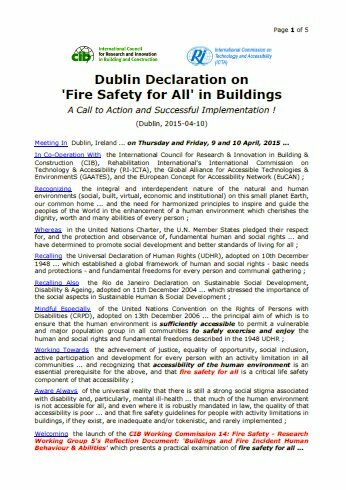 As I write … Ireland has a truck load of accessibility-related National Building Regulations and EU Safety at Work Law (transposed at national level a long, long time ago). We have strong Equality Law. We have ease of access to accessibility-related International Standards (such as ISO 21542: 2011) and National Standards from other European Countries, North & South America, and Asia. We have accessibility-related National Guidance Documents coming out of our ears, and easy access to all sorts of other guidance from around the world. Lots and lots and lots and lots of paperwork, in digital and hardcopy formats ! Ireland today … is still one of only a few remaining countries which have yet to ratify the United Nations Convention on the Rights of Persons with Disabilities (CRPD), the principal aim of which is to ensure that the Human Environment (including the built, social, economic, virtual and institutional environments) is sufficiently accessible for people with activity limitations to participate positively in all aspects of their local communities … a basic human right, which every able-bodied person takes for granted ! 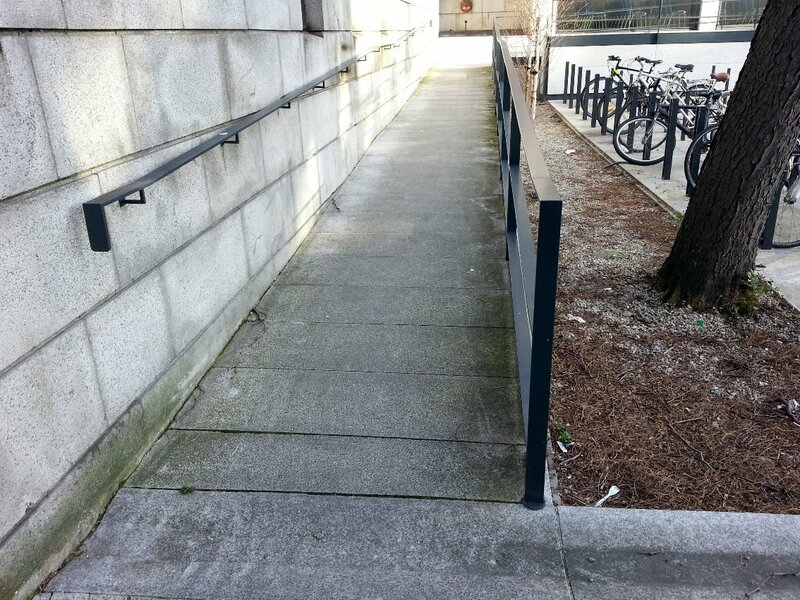 AND … as I look around Dublin … the City is NOT accessible for its many vulnerable residents and foreign visitors ! Colour photograph showing the Main Entrance to Dublin Castle’s Printworks Building. Telepathy is required to be ‘aware’ that there is a ramp located way down at the far end of the building. Notice the limited extent of ground tactile information at the bottom of the steps in the foreground, and the unmarked glazing on the left of the Entrance Doors above. Mr. Sean Sherlock, T.D., Minister of State at Ireland’s Department of Foreign Affairs with responsibility for Overseas Development Aid, has agreed to open the Event on the evening of Thursday, 9 April 2015. All of Irish Aid’s Partner Countries in Africa have ratified the UN Convention on the Rights of Persons with Disabilities. Given the serious, socially transformative topic of this Conference … the Minister had also kindly offered to waive the fee for the hire of the Printworks Building in Dublin Castle – a very prestigious location in the City, and a building which was been extensively refurbished in time for Ireland’s recent Presidency of the European Union. The audio-visual fit-out for this building is magnificently elaborate. Most unfortunately, the building’s accessibility is entirely inadequate (‘ATROCIOUS’ would be a better word to describe it) ! 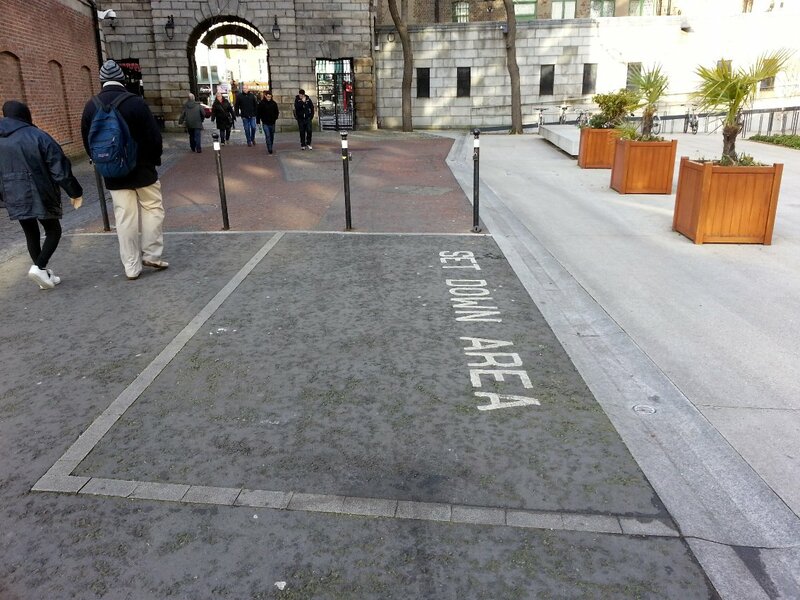 Colour photograph showing a marked Set Down Area at the front of Dublin Castle’s Printworks Building. 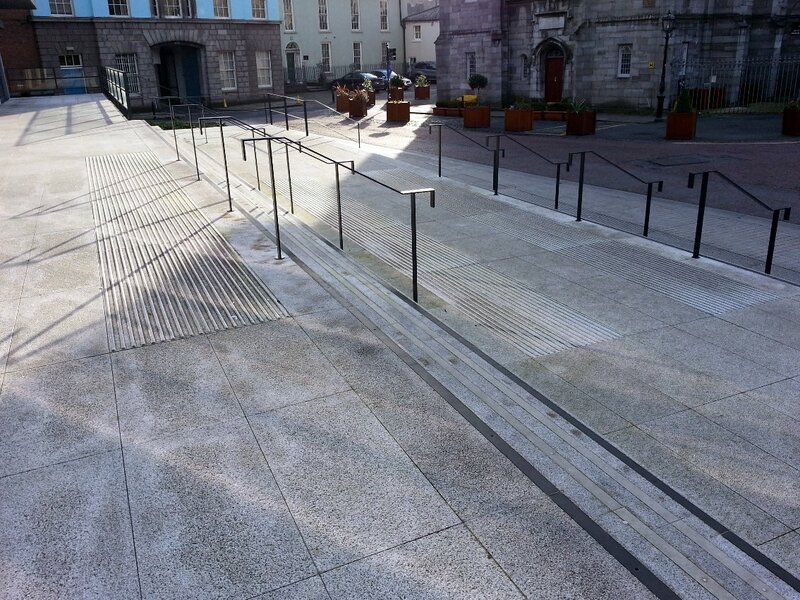 Bollards prevent a Taxi from dropping off a passenger, who uses a wheelchair, at the bottom of the ramp. However, with the right attitude and positive co-operation from the Venue Management Team, many improvements to the building’s accessibility could have been made for the Conference. From the beginning, however, the Management Team’s response to this issue was negative. Colour photograph showing, from above, the Main Entrance Steps of Dublin Castle’s Printworks Building. Also notice the hazardous lack of visual colour contrast in platform and step surfaces. The Venue Management Team has refused to honour the Minister’s waiver. Colour photograph showing the Top of the Ramp at the side of Dublin Castle’s Printworks Building. Notice the lack of ground tactile information. 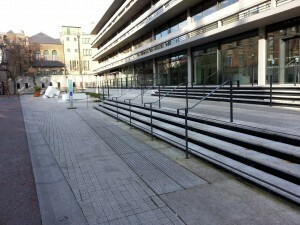 We have had no other option but to move the Conference and Workshop to a far better Venue just around the corner … the Radisson Blu Hotel in Golden Lane, Dublin. 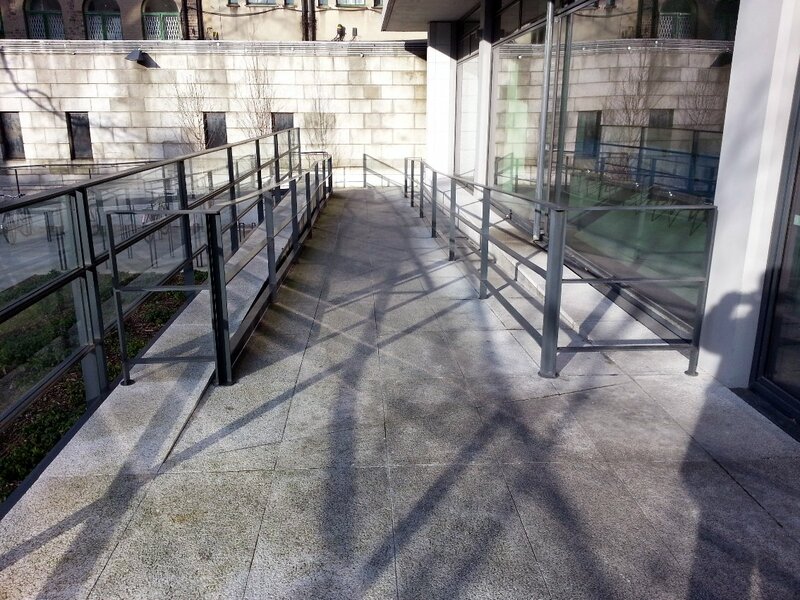 Colour photograph showing the Bottom of the Ramp at the side of Dublin Castle’s Printworks Building. Notice the difficult approach to the Ramp, and also no indication of where there are level surfaces to rest when using the Ramp. 1. States Parties, in accordance with their system of organization, shall designate one or more focal points within government for matters relating to the implementation of the present Convention, and shall give due consideration to the establishment or designation of a co-ordination mechanism within government to facilitate related action in different sectors and at different levels. 2. States Parties shall, in accordance with their legal and administrative systems, maintain, strengthen, designate or establish within the State Party, a framework, including one or more independent mechanisms, as appropriate, to promote, protect and monitor implementation of the present Convention. When designating or establishing such a mechanism, States Parties shall take into account the principles relating to the status and functioning of national institutions for protection and promotion of human rights. 3. Civil society, in particular persons with disabilities and their representative organizations, shall be involved and participate fully in the monitoring process. 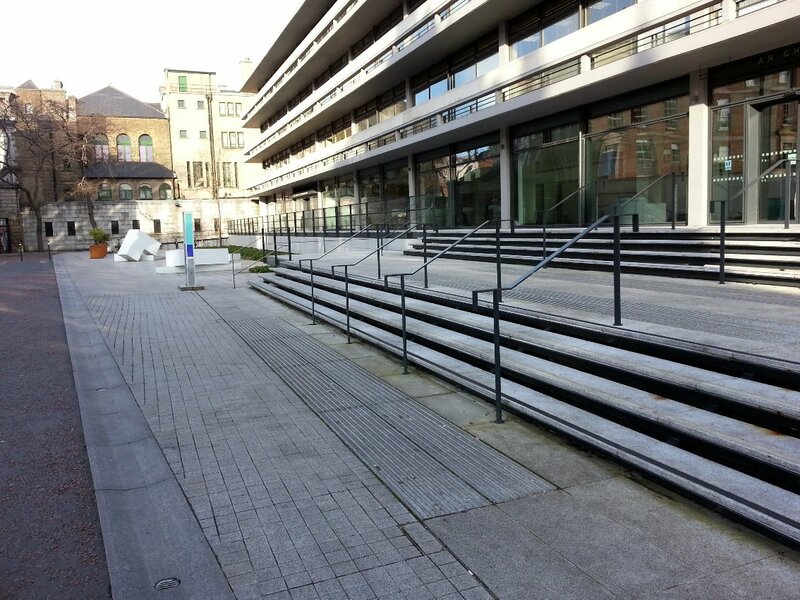 The Access Consultants for Dublin Castle were O’Herlihy Access Consultancy.